It all started with one child. On a cold November morning in 1886, a three-day-old baby boy was left on the doorstep of a prominent family in Des Moines, Iowa. 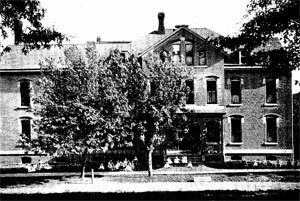 Within 24 hours, Elizabeth Mann and two of her friends had established the Home for Friendless Children, the city's first orphanage, which was soon renamed the Des Moines Children's Home. It has since evolved into the organization we know today as Orchard Place. No longer an orphanage, Orchard Place now helps many of the state's most emotionally troubled and helpless children, striving to help them develop strong, promising futures. Through our four branches of service, we contribute to the community's well-being by serving the mental health, substance abuse, educational and juvenile justice needs of children, adolescents and young adults. Orchard Place is a nationally recognized leader in children's mental health and juvenile justice services, and is one of only a few organizations in the country that incorporate both mental health and juvenile justice services for children and adolescents.